Treasury Secretary Steven Mnuchin testifies before the Senate Banking Committee on Capitol Hill in Washington, Jan. 30, 2018. The Trump administration on Tuesday defended its decision not to impose immediate sanctions on Russians named in a congressionally mandated report detailing the wealth and political activities of Kremlin insiders and billionaires. The U.S. Treasury Department published the report Monday in keeping with a law passed overwhelmingly by Congress last August, after it became clear that Russia had meddled in the 2016 presidential election. The report details the finances and political connections of 114 Russian politicians and 96 "oligarchs" who have prospered under Putin. But the report makes no mention of imposing new sanctions against the Russian government or individuals on the list, raising questions about whether Trump is too soft on the Kremlin. Confronted by Democratic Senator Bob Menendez of New Jersey during an appearance before the Senate Banking Committee on Tuesday, Treasury Secretary Steve Mnuchin said sanctions were in the works. "I assume you haven't read the classified version [of the report]," Mnuchin told Menendez. "The intention was not to have sanctions by the delivery of the report last night. There will be sanctions coming out of this report." In a statement accompanying the release of the report, State Department spokeswoman Heather Nauert said there were no immediate plans to impose sanctions on Russia or any of the individuals named in the document. FILE - U.S. State Department spokeswoman Heather Nauert speaks during a briefing in Washington, Aug. 9, 2017. Nauert said the law was already hurting Russian companies. "Today, we have informed Congress that this legislation and its implementation are deterring Russian defense sales," Nauert wrote. "Since the enactment of the ... legislation, we estimate that foreign governments have abandoned planned or announced purchases of several billion dollars in Russian defense acquisitions." “That is real success, it's real money, and it's real revenue that is not going to the Kremlin, and is not going to Russia,” he said. The State Department clarified on Tuesday that January 29 was not a deadline to impose sanctions against those named on the blacklist. “It was the day on or after which we could start imposing sanctions if we make the determination here at the State Department of activity that falls under the provision,” said the State Department official on Tuesday. He was referring to Section 231 of the “Countering America's Adversaries Through Sanctions Act” (CAATSA) which is the Congressional mandate for the sanctions. Russian President Vladimir Putin called the report a "hostile step," but said the Kremlin had chosen not to take immediate retaliatory action. "We were waiting for this list to come out, and I'm not going to hide it: We were going to take steps in response, and, mind you, serious steps, that could push our relations to the nadir," Putin told a political rally in Moscow Tuesday. "But we're going to refrain from taking these steps for now." Several Russians made light of the list, saying it looked as if it had been copied and pasted from the Forbes list of Russian billionaires and a list of officials named on a Kremlin website, since all of them were included. 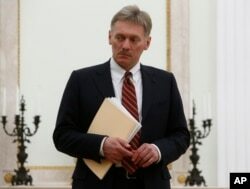 FILE - Kremlin spokesman Dmitry Peskov is seen at the Kremlin in Moscow, March 27, 2017. Peskov likened a report detailing the wealth and political activities of Kremlin insiders and billionaires to a U.S. enemies list. Kremlin spokesman Dmitry Peskov commented that the report in effect constituted a list of "enemies of the United States." Trump, whose ties to Russia are the subject of a special prosecutor's probe, criticized the report last August when he signed the Countering America's Adversaries Through Sanctions Act. He called the legislation "seriously flawed," arguing that it "improperly encroaches on executive power, disadvantages American companies and hurts the interests of our European allies." Reaction to the administration's decision to withhold sanctions split predictably along party lines. Democrats and many foreign policy analysts questioned Trump's apparent reluctance to take action against Russia, given the evidence of Kremlin interference in the election that brought him to power. "There is a hollowness to our policy toward Russia," said Richard Haass, president of the New York-based Council on Foreign Relations, in an MSNBC interview Tuesday. "Russia is anything but a status quo country. It is a spoiler and in many parts of the world it has set out to oppose American interests." 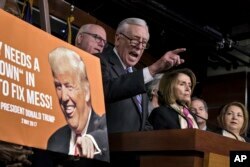 House Democratic Whip Steny Hoyer of Maryland called on the administration to promptly "put forth a plan for how it plans to deter further Russian aggression." FILE - House Minority Whip Steny Hoyer, D-Md., speaks at a news conference at the Capitol in Washington, Jan. 20, 2018. "Sanctions are a deterrent only if countries believe the U.S. will impose them," Hoyer said in a statement. "The anemic announcements, with no statements from senior administration officials, do not give me confidence that this is the case." The lead author of the CAATSA law, Senate Foreign Relations Committee Chairman Bob Corker, on Tuesday expressed satisfaction with the diplomatic steps the administration was taking to ensure compliance. "Yesterday merely marked the effective date on which sanctions will be imposed when and if significant transactions with the outlined blacklisted actors occur. This is in accordance with the law as written," the Tennessee Republican said in a written statement. "On the whole, it is clear the administration is working in good faith." Russian opposition leader Alexei Navalny hailed publication of the list, tweeting that he was "glad to see these [people] have been officially recognized at the international level as crooks and thieves."